The gloss, depth of color, and precision of our acrylic/ABS forming is unparalleled – or you may be looking for a low-gloss, soft touch texture. The aesthetics we can achieve with our thermoforming capability will far exceed what you thought possible. Our forming machines can accommodate most any size tooling configuration. We specialize in large parts – up to 96” X 216” and deep draw parts. 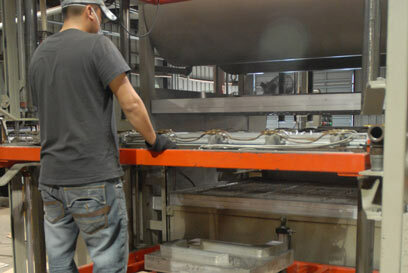 We operate 6 modern forming stations including the latest in quartz, zone heating technology. 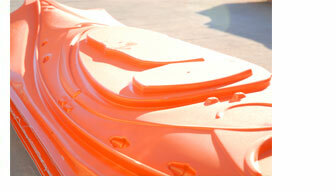 We form ABS, Styrene, PETG and other specialty resins. We offer custom CNC trimming, decal application and assembly services. Accuform recycles their scrap and waste plastic, either by compressing in a baling machine or by feeding into a granulator (grinder) and producing ground flake, for sale to reprocessing companies or re-use in their own facility. Frequently, scrap and waste plastic from the thermoforming process is converted back into extruded sheet for forming again.